Purpose: The belt buckle is a stylish accessory that can complement almost any outfit while also promoting your business. It is a practical and thoughtful gift that can be personalized to fit any occasion. Strategy: Diligent and committed employees’ are the backbone of any thriving company. In order to honor their employees’ loyalty, a large agricultural company decided to gift those who had worked for them 5 years or more with a personalized belt buckle. Results: Employees were grateful for the gesture and enjoyed having such a practical reward for their service. This resulted in an increase in their overall productivity and satisfaction. They were also able to wear the belt buckles while out on the job which resulted in an increase in emblem recognition. Prized & practical wearable recognition! 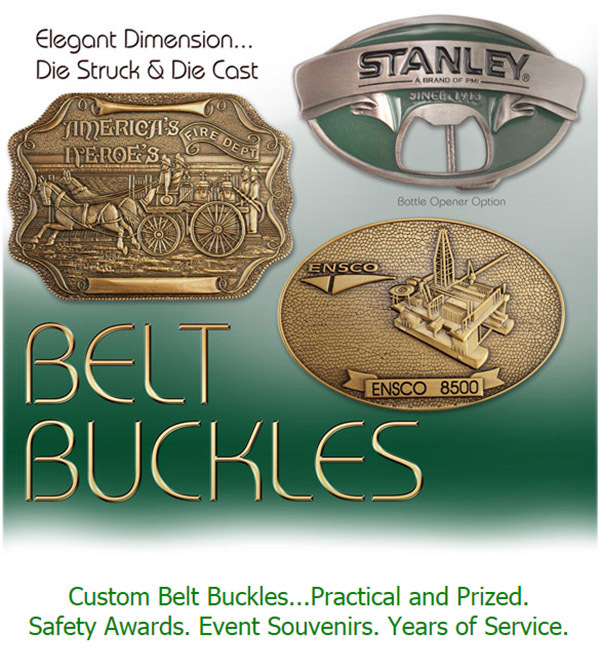 EMT Belt Buckles Provide Wearable Recognition. No Extra Charges on Custom Shapes. Reproduce intricate designs or logos in any size or shape. Choose from 2-dimensional or 3-dimensional high relief. Custom shape at no extra charge. Optional soft enamel or resin enamel colorfill. Free PMS color match. Enhancements include personalizations, numeral tabs and consecutive numbering. 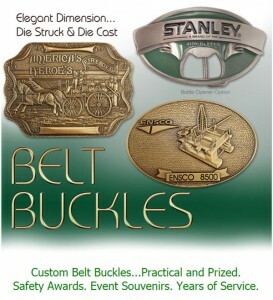 Curved die struck buckles available. Contact EMT for a custom quote. Optional pave jewels for a upscale, fashion appearance. Production time: 4 weeks. Rush service available.